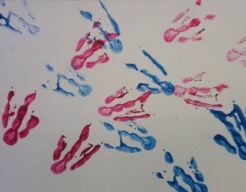 The WAVE Foundation offers original penguin artwork made by the Newport Aquarium’s African Black-Footed penguins! 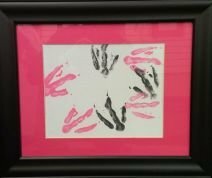 This artwork makes for an unforgettable gift for any adult or child. Choose from the following selection of penguin art sizes for sale, or choose the opportunity to join the artists behind the scenes to make your very own penguin art. Artwork is also available in the Newport Aquarium’s Gift Shop! Each penguin art can be custom made with your choice of colors, and comes with a Certificate of Authenticity, an information sheet about the artists, and a color photo of the artists in action! Download the Penguin Pitter Patter Spatter form to order by mail. custom penguin paintings are unavailable for purchase. 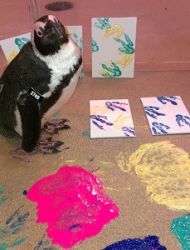 You and three guests can join our African Black-Footed Penguin artists at your own personal art session! 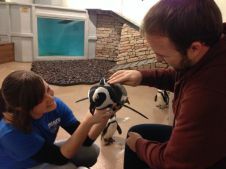 Our staff will take you behind the scenes of the Newport Aquarium to our Penguin House, where you can choose your favorite colors and watch as our little Picassos go to work! The VIP Penguin Lover’s Package is a 20-30 minute experience and includes four 11×14 art canvases that our penguins will paint and you can take home. You will also get the opportunity to touch our feathered friends and ask any questions. This experience is definitely something that you won’t want to miss! Your purchase, excepting $50, is tax deductible! To purchase Penguin Artwork or to schedule a VIP Penguin Lover’s Package call 859.815.1418, email wave@wavefoundation.org or visit the Newport Aquarium’s retail store. All proceeds from penguin art support the WAVE Foundation’s efforts in education, conservation and volunteer initiatives. Thank you for your support!